We believe this cereal debuted in the U.S. in the early 60's as "Sugar Ricicles". 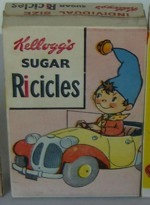 Ricicles are still available in the U.K. where it has been described on the box as "cosmic bubbles fortified with vitamins and iron." What do you think of Ricicles? We used to have it in Belgium (that's a country in Europe, not some unknown small town in America) during the 80's. The box art was a little different back then. It stopped being available somewhere in the late 80's. I don't understand why really. People love frosted corn flakes and this is the Rice Krispies version of that. 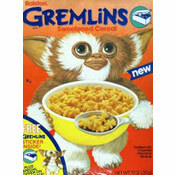 I wish Kellogg's would bring it back. 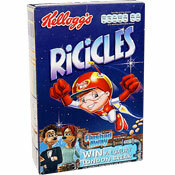 I love Ricicles more than life itself. Can you get this in the states? If not, I'm sad 4 u.